I've used this picture on a few posts and would like to add a little more about its story. It's from way back in 1971 when I jumped into a small runabout and took pictures of Frank Bethwaite sailing with Julian at Northbridge Sailing Club. Most sailing pictures are boring because they're taken too far away, so my goal was to get some close-up shots. The NS-14 (which stands for Northbridge Senior) is an amazing "development class" because, as you can see in the picture, they're planing upwind with no trapeze and the boat has just 100 square feet of sail. In fact, its DNA can be found in many other classes including Julian's 49er. 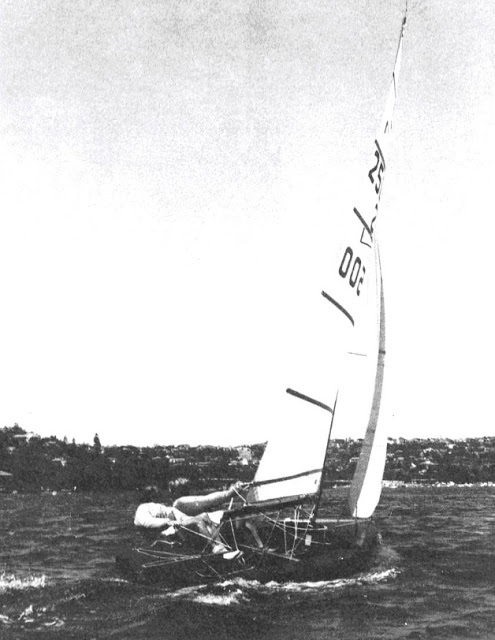 Frank commented at the time that the pictures were the best he had seen for NS-14s and he later used this picture on page 254 of High Performance Sailing. Thirty years later told he how this picture changed his thinking about how rigs work. So, who can tell us what Frank saw and why it changed his thinking? Frank realized that the fastest way to get to the yacht club bar after racing was to have the sail very flat in the gusts. A good guess, but incorrect. The "over-rotating rig" is interesting because the top does not fall off in a gust like a Laser. If anything, the mast bends more to windward in a gust, making the rig very rigid and powerful. The mainsail is a lot flatter than the jib and both sails have very little twist. What that means, I have no idea. Good points, but incorrect. This little photo contest is quite difficult as I'm not sure if Frank noticed its significance for a while. Well, if Frank had a hard time spotting it, how in the world do you expect mere mortals to do so? Could it be the small outboard cleverly nestled by the pintle (or gudgeon - I can never remember which is which). Frank looked at this photo and realized that rather than trying to design fast boats to get to the yacht club bar first after racing, it made more sense to carry a cooler of beer on the boat. I notice that the masthead feather shows that the masthead is directly upwind of the camera. But you can see the windward surface of the upper jib and it is not flapping. This is because the local wind just ahead of the mast is deflected to leeward by the mainsail. Plus I don't think there's any beer left in the cooler. Correct - well done!! You have very good eyes to see that there is a feather that I was trying to line up with. I always thought that jibs were more efficient because there is no mast in front, but there's another reason. The wind going around the mast and main deflects the wind, so the jib is actually sailing on a lift. Pretty cool! LOL. Thanks for not pointing out that I lifted that answer word for word from page 287 of Bethwaite's High Performance Sailing. I was wondering (1) how you saw the feather when it was lined up so well and (2) why an NA sailor would use the Aussie term "feather." Now we know. PS: I should have mentioned that with Frank's help when I built my first NS-14, it did in fact have a small beer cooler back hatch. But out of respect for the integrity of the designs and intensity of the sailors, I never used it. Good man. I think a small beer cooler built into a racing dingy would be a real winner in the market place. The RS Aero does actually have a cup holder, but what's the point of something that can only hold one bottle of beer?